Wow, that’s a blast from the past. I hadn’t thought about that name in 15 years. If you look at the scan of the back it's not even a Paul Maul silhouette. Looks like Mutt's or maybe Pure Hex. I strongly suspect a Mutt's was next to it in the stack [for a long time] which is what caused that. Pure Hex has a longer neck on the bottle...and, this would make sense as the checklist sequence would have Mutt's right under Paul Maul. Not the most extreme example by any stretch, but has anyone noticed how common it is for sellers to overvalue the 1979-80 reissues? I check eBay occasionally for random lots to see if I can bag some Series 3-4 titles that were never repeated again in the albums or Flashbacks, for making homemade magnets mostly, and I’m amazed how commonly minimum bids start at $1 or more per sticker, sometimes north of $2 each. Even if they came straight out of packs, these prices seem way out of whack to me. A search for “1980 lot” reveals most of the listings to be like this. 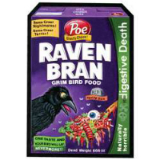 A patient buyer can find common series OS lots at cheaper prices than this. Crazy. Whoooo knows what evil lurks in the hearts of men? The SHADOW KNOWS!!!!! When I see listings like this, I get pumped up, because, based on this "NM-" 6-Up, ALL of my stickers would easily come back from PSA as 10's! And all of my copyright error stickers (borderless) would probably return as 8's & 9's! 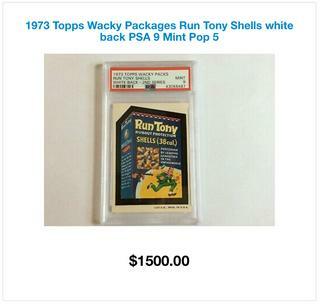 What's better than purchasing a slabbed, PSA 6, legitimate Wacky Packages Hostess Pair for $309.89? Well, it's quite simple... purchasing these "Excellent Condition/White Backs*RARE* NM Mock Hostess Pair Of Stickers" for $319.00! Just trying to decide if i want to buy this nonsense..
....and the art is Briliant! I guess the response fits in fine. I'm not a fan of barf but I do like Heave Cigarettes. Yes, but that doesn't make it valuable -- only demand will drive that. It depends. How many bags were produced? Are the bags autographed? Is there a certificate of authenticity? Was the bag meticulously sealed in a PVC free, acid-fee, UV protected barf bag binder page? No, he just needs to redefine "NM" as '"Nicely Mangled." See you in AT Dr.S! Holy crap!!! If it sells as a best offer we'll never know what the actual price was, right? We can find out the accepted best offer. Crazy that there were only two 9s for so long and there have been three more in the last few years. This one looks toned. And a reasonable price for the Band-Ache 9 is around $2K. I agree, it looks toned, and I wonder what the back looks like - probably toned, too. The Bandache 9's price was cut nearly in half. So now it’s only 400% too high!